How have twins been viewed throughout history? Why do twins continue to fascinate us today? In this research conversation, Will Viney outlines his new research project, which aims to show the different ways in which twins have been used as tools of thought in science, myth, and literature. Your new research project is a cultural study of twins across history and through literature. What got you interested in studying twins? As an identical twin I grew up as an object of other people’s curiosity. Much of this curiosity seemed to be levelled at our appearance – “oh you’re so similar!” or “oh, how disappointing you’re not more alike!” I started paying closer attention to how and why people are interested in twins and I soon realised that a likeness in physical appearance is just one among many reasons why twins are treated differently to those born alone. For example, we recently enrolled in a genetic and epidemiological study based at Kings College London, the largest of its kind in the UK. Despite the troubled history associated with using twins in genetics, twin research remains big business. There are roughly 140 of these registries around the world, involving 1.5 million research participants. Many of these research projects use twins as a methodological means but not necessarily an analytic end. Instead, twins tend to be employed to unravel the nature of complex diseases and disorders. One of my aims over the next few years is to try and show how the use of twins as tools, as a means by which to think about who and what we are, has a long and complicated history that stretches back to Greek antiquity. Since then, twins have been instrumentalised as tools of argumentation, as a means to articulate different beliefs and suspicions, and as human figures with peculiar relationships to a range of rhetorical tropes. There’s a complex story to tell about the telling power of twins and it was realising this, rather than any uncanny tricks played by my brother and I, that convinced me that a project about twins was worth taking further. In what ways have twins been “tools of argumentation”? How were twins historically used as metaphors? I want to show how twins have been used as ”living proof” for various beliefs. In that respect they have been employed as tools in the craft of proving one thing or another. So, as ”embodied evidence,” twins are often seen as humans that permit a word, code, or dogma to be made flesh. That’s not to say that twins are stable or passive objects through which to prove something. In my experience twins are quite happy to tell you whether your assumptions match their reality. What’s interesting to me is that the instability that surrounds the status of twins affords a multiplicity of arguments to be made by them. The different scales, times, and places in which this twin-tool relation has been exercised is one of the more striking aspects of twin history. He said to God, “Lord, I want to be saved but these thoughts do not leave me alone; what shall I do in my affliction? How can I be saved?” A short while afterwards, when he got up to go out, Anthony saw a man like himself sitting at his work, getting up from his work to pray, then sitting down and plaiting a rope, then getting up again to pray. It was an angel of the Lord sent to correct and reassure him. He heard the angel saying to him, “Do this and you will be saved.” At these words, Anthony was filled with joy and courage. He did this, and he was saved. Anthony sees and hears himself as a model, a guide, his own twin. If one compares this to the twin tradition of Thomas then the figure of the holy twin may institute what Peter Sloterdijk has identified as the beginnings of “intimate religiosity” – a relationship between the interior space of the soul and a third-person perspective from which we observe ourselves as an other, an alternative, or model that spatialises introspection. Since this relation of introspected surveillance is by no means a universal relation, Sloterdijk claims that this sacred twinliness generates a spatial dynamic that permits a colonising style of thought, an observational structure in the religious practice of the west. If this is true – I’m not sure that it is – then here we see twins as both tools in an argument about life’s parallel possibilities as well as a particularly ”human” model for moral reasoning. So do twins still carry these mythical or metaphorical connotations today, even in our age of genetic science? While what I want to call ‘the twin-tool relation’ does not operate in the same way in all its temporary locations, I think there are grounds to compare the exemplary status given to twins in both science and religion. Even the tacit way in which people make comments about or compare twins in light of notions of genetic heredibility makes twins the bearers of an abstract and intergenerational chemistry. Francis Galton claimed 130 years ago that some twins “are continually alike, the clocks of their two lives move regularly on at the same rate, governed by their internal mechanism.” Since then the progress of human genetics has been bound to the self-perpetuating separation of twins. Geneticists have idealised and loaded them with potential. Supporting what some sociologists of science call “communities of promise,” they give credence to a kind of biomedical science that is strongly orientated towards the future. The twin method, which I mentioned earlier, makes a particular contribution to this promising separation of the twin. If you isolate one trait, eye colour for example, and compare identical twins (‘identical’ in terms of their genetics) with non-identical twins (no more genetically alike than other siblings) then, assuming an equally-shared environment, the statistical variance between the first group and the second for this trait will be genetically determined. What twin studies offers is a more precise disaggregation of environmental and hereditable factors for a particular trait across populations. This is because twin research uses (and assumes) the shared environment of both groups of twins in attempt to control all the other variables that might influence a particular characteristic. For this power to control variables twins of both zygosities are felt to be “living laboratories”, “a unique ‘natural’ experiment”, offering “knowledge and insight for everyone, not just for twins.” I’d like to speculate that the capacity for twins to be drawn into and thus embody certain models of thought can form a basis for comparing their inclusion in both religious and scientific systems of belief. Finally – and this is something whose consequences I am still trying to understand – there is the fascinating thought-experiment debated by Henri Bergson and Albert Einstein in the 1920s. Einstein’s “twin paradox” explains his special theory of relativity using two identical twins. If one twin travels into space and travels close to the speed of light while the other remains immobile on Earth then the travelling twin, on his or her return to Earth, will be younger than his/her sibling. Their clocks and calendars would not agree. It took some years before the thought experiment became a point of dispute between Einstein and Bergson. Things came to a head in 1922 when Einstein met with Bergson for a debate in Paris and here Bergson claimed that one of the twin’s time was “real” while the other’s was ”fictional.” For him, whose time counted as ”real” was a matter of negotiation – time’s reality is a question of how the twins resolve their differences. Einstein, with some flamboyance, argued that Bergson had simply failed to grasp the science – the twin’s times were both and equally correct. What is fascinating in this episode is how the experimental story helps enmesh twins – once again recruited for the somatic and environmental control they promise – within a debate about the philosophical significance of a new physics. We may have come a long way from the deserts of the early church but what remains is the modeling of and with twins. You say that twins today allow us to study the influence of genes upon two similar individuals. However, the gene is only a relatively recent discovery. How, then, were twins explained in the past? As freaks of nature? Or as things which can tell us about the inner workings of nature? I agree that we should periodise twins and their study according to the objects, such as genes, that they seem to give access to. One of the things I hope to do is compare Aristotelian, Hippocratic, and Galenic texts about twins, which frequently recall the ways in which twins traversed human and monstrous conceptions of nature. These texts show how imaginative and early scientific responses to twinning grew out of attempts to distinguish twins from animals, from humans, or both. Having established the importance of ancient wisdom and folk medicine in the care of twins, I’d like to contrast the imaginative literatures of the thirteenth and fourteenth centuries with contemporary obstetric, gynaecological and theological writings, showing how the status of twins in this period was deeply attached to the ”difficult” biological nativity. Twins have not always been viewed with the positivity that they now tend to enjoy. In contrast to the biopolitical celebration of twinship, prevalent where the risks to somatic and social health have been significantly curtailed, medieval and Renaissance twins were frequently viewed with suspicion, showing how the wider historical status of twins has become inextricably linked to the narrative explanations of their presence. 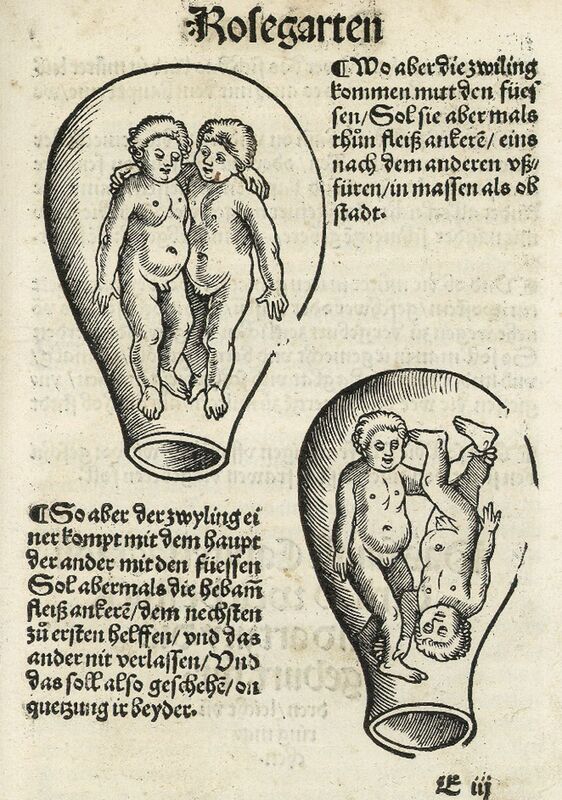 We can see the emergence of a technical approach to twin in the visual material that arose directly out of the dangers associated with twin pregnancy and delivery, especially in Germany, France, and England, in the period 1400–1600. Secondly, the literary record of the same period takes the birth of twins as a moral test, often to raise questions about sexual, marital, chivalric and religious propriety. Here we see twins employed as imaginative devices, rhetorical tropes, and argumentative shorthands for wider claims about historical change, religious meaning, political union, cultural origins, and the agency of the natural realm. Why is literature a particularly good way of studying twin history? What can a literary focus show us that we can’t get just by looking at historical or scientific documents, for example? I don’t think that literary texts offer a privileged view from which to understand twinship as it emerges over several millennia. But some literary texts do seem to have a capacity to entertain and reflect upon a number of competing perspectives on twins. In my view, this makes literature useful for learning why, despite prevailing biomedical models, the meanings attached to twins remain extremely various. As I indicated earlier, twins are unusual for being human subjects that have been consistently investigated, held up as exemplars, and used to demonstrate a truth about human life and material environments. Twins remain enchanting and fantastic to many people of many cultures; they are the subject of an ever-growing body of imaginative literature that has explored the strange and seemingly impossible. Studying literature might provide an opportunity to make some comparisons between the scientific instrumentalisation of twins and the roles given to them in literary texts. Doing so might also show how human twins can operate between radically different, some might say opposed, epistemologies. Studying science fiction narratives like Aldous Huxley’s Brave New World alongside formal, experimental twin fictions such as James Joyce’s Finnegans Wake (1939), Michel Tournier’s Gemini (Fr. Météores, 1975), and Agota Kristof’s trilogy, translated as The Notebook (1986), The Proof (1988), and The Third Lie (1996), we can see how the figure of twins can be used to make and unmake arguments, to both instrumentalise twins and to cast doubt over their effects. This, I’d like to argue, is the rhetorical potential of twins – while they are used to articulate or clarify claims about both who and what we are, they can also be used to produce dissonance and confusion. It might be the enduring semantic flexibility of twins, as cohering and disruptive agents, that links artistic and scientific interest in twins. So long as they are subjects felt to be replete with utile ends their meaning remains unresolved, without end, in a state of permanent experiment. A consideration of contemporary novels, film and the visual arts can articulate the continuing relevance of older or ‘outdated’ stories, mythologies, and superstitions about twins and how these sit alongside molecular explanations. Apophetegmata Patrum Aegyptiorum, The Sayings of the Desert Fathers, trans. Benedicta Ward (Kalamazoo, MI: Cistercian, 1975), pp. 1f. My italics. Peter Sloterdijk, Bubbles: Spheres Volume I: Microspherology, trans. by Wieland Hoban (Los Angeles: Semiotext(e), 2011), p. 463. Francis Galton, Inquiries into Human Faculty, ed. Gavan Tredoux (1883; Everyman, 2001), p. 169. For one of a succinct and thorough account of twins in research, see Thomas Teo and Laura C Ball, “Twin research, Revisionism and Metahistory” History of Human Science 5 (2009): 1–23. See also David Burbridge, “Francis Galton on Twins, Heredity and Social Class” The British Journal for the History of Science 34, (2001): pp. 323–340. See Nick Brown and Mike Michael, “A Sociology of Expectations: Retrospecting Prospects and Prospecting Retrospects”, Technology Analysis & Strategic Management 15 (2003): 3–18. Nancy Segal, Entwined Lives: Twins and What They Tell Us About Human Behavior (New York: Putnam, 1999), p. 1; Tim Spector, Identically Different: Why You Can Change Your Genes (W&N: London, 2012), p. 20; ‘The Use of Twins in Research’. BRC Biomedical Forum, Guy’s Hospital, 9th January 2013; Nancy Segal Born Together–Reared Apart: The Landmark Minnesota Twin Study. Cambridge, MA: Harvard UP, 2012. For an extensive discussion of this dispute about time, see Jimena Canales, ‘Of Twins and Time: Scientists, Intellectual Cooperation, and the League of Nations,’ in Neutrality in Twentieth-Century Europe: Intersections of Science, Culture, and Politics after the First World War, edited by Rebecka Lettevall, Geert Somsen, and Sven Widmalm (London: Routledge, 2011), pp. 243–270. Reblogged this on The Wonder of Twins. Reblogged this on The Digital Humanities Centre. As the parent of twins, I found this very interesting. Thanks for posting! This isn’t related to Playcentre but…are there any Catan fans among you?